Palmia Observatory: More on ISS transit; Travel to 2019 Eclipse in Chile? ; Cosmic origin of the elements; A Journey of the Universe; Scattered light and wavelengh dependence; Gravity Guy Ken spies glowing orbs in the sky! Merry Christmas! More on ISS transit; Travel to 2019 Eclipse in Chile? ; Cosmic origin of the elements; A Journey of the Universe; Scattered light and wavelengh dependence; Gravity Guy Ken spies glowing orbs in the sky! Merry Christmas! Maybe I could have also seen a little white dot for the Dragon too if the exposure time were set a little shorter. Anyway, I didn't expect to capture any detail of the ISS because I had previously photographed a high flying aircraft by tracking its jet contrails and could just barely make out any details of the aircraft, and since the ISS is flying about 50 times higher, and its angular size would have been seen to be similarly 50 times smaller, it is going to be hard to see any detail. Maybe somebody else out there has taken more detailed images of the ISS with longer focal length lenses and tracking mounts? Separately, we did some preliminary planning regarding travelling to Chile to see the total solar eclipse of July 2, 2019. Well, darn, it seems that most of the advertised tours going there have already been sold out! We still might be able to find someway of going anyway, or maybe just wait for the eclipse in 2020 or even just wait for the 2024 total eclipse that goes across the U.S. What are you planning to do? Our copy of Sky and Telescope magazine just arrived and it has some interesting articles, one of which I wanted to share. One of them had a discussion of what is now theorized about the origin of the elements in the periodic table. We had also discussed this several times in previous posts, the most recent in the October 20, 2017 post, where the recent LIGO announcement of merging neutron stars was announced. The cosmic origin of the elements in the periodic table can now be pretty much traced to the astrophysical process during which they were created. 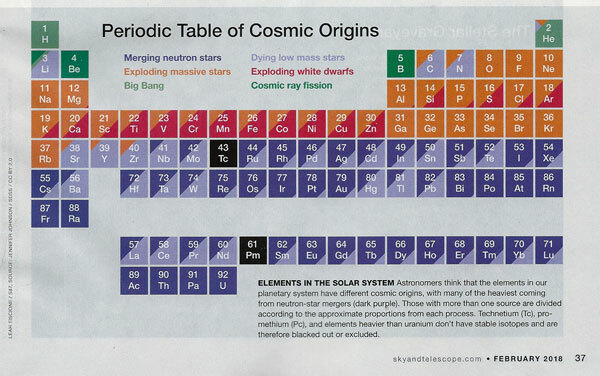 This periodic table, of much higher print quality in the S&T magazine identifies the element and its suspected source: Merging neutron stars, exploding stars, the big bang, dying low mass stars and cosmic ray fission. We can see that most of our more common elements come from exploding stars and the very heavy elements, such as gold, silver and uranium, come from merging neutron stars. 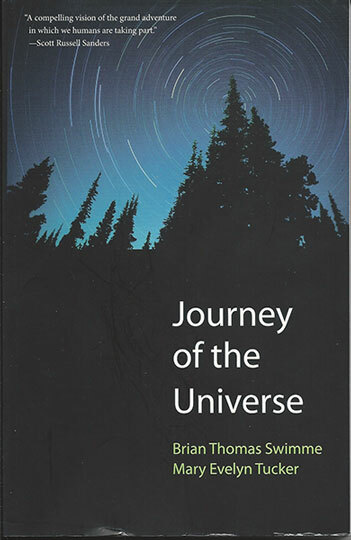 Another interesting book that found its way to my desk with the help from all of my friends at Amazon, was this short, less than 200 pages, Journey of the Universe. This book written by two professors of environmental science, tell the history of the universe, and include only a few sentences on environmental stewardship. The book is very delightful and easy to read and emphasizes the wonder and mystery of the universe from the big bang to the evolution of the solar system and life and how finally, at this time, we humans are able to look up at the stars and wonder and ask why and develop some answers and understanding. If you are looking for a short read that starts at the big bang and ends with us, and has no equations what ever, then check out this little book! Ok, so that was an easy read, but now its time to go back to some more detailed physics. 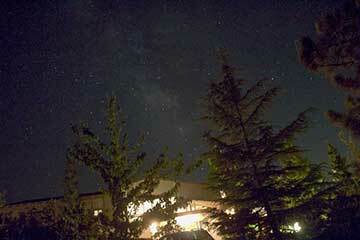 Previously we have performed measurements to estimate the magnitude of the night sky. The reason the night sky is polluted by city lights is that the outgoing light is scattered high in the atmosphere and then comes back down toward us on the ground. To get a better technical understanding of the theory of scattering, I started to go back over some old electromagnetic theory textbooks to understand how light, which is an electromagnetic wave, is scattered by air molecules and other particles in the air. 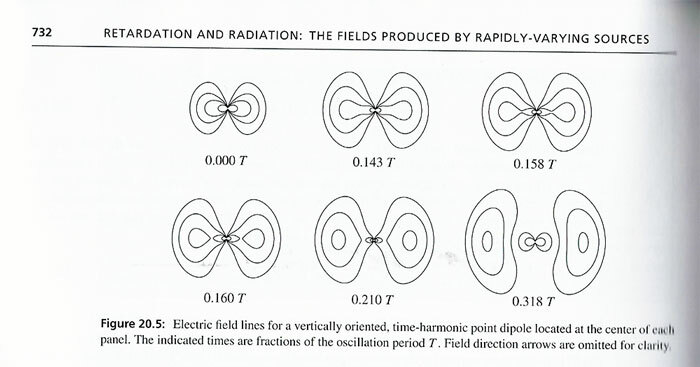 First, however, I found this very interesting diagram (ok, ok, it is probably only very interesting to physicist wannabes like me) which shows how one can calculate the point at which the electric field around an antenna first begins to collapse and disconnect from the antenna and become its own isolated piece of electromagnetic radiation that separates and propagates out through space. Just work your way down from the top left to the bottom right when at that particular instant in time, the electric field disconnects from the source. This is the first time in many years of studying electromagnetism that I finally can picture how these waves get spun off and leave the antenna. Zangwill and others describe how electromagnetic waves are scattered off of charged particles and neutral atoms and larger airborne particles like dust and rain and cloud droplets. The scattering of light by small particles, much smaller than the wavelength of the light, is called Rayleigh scattering, and has the characteristic that the amount of scattering varies inversely with the fourth power of the wavelength. This means that short wavelengths of visible light, like the blue and purple, get scattered much more than do the longer wavelengths, such as red. Remember, this is what we learned in school as to why the sky is blue. 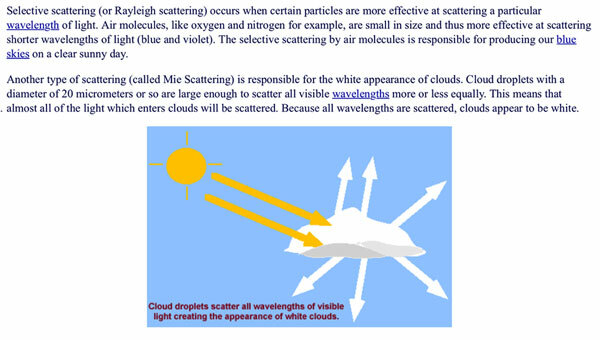 The other type of scattering, which is really not a different kind of scattering, is called Mie scattering, which describes the effect of scattering from particles that are essentially the same size as the wavelength of light, such as fine dust and aerosols and clouds. In this case, the amount of scattering is not a function of the wavelength of light and all wavelengths tend to be scattered by the same amount. This is particularly easy to see for light reflected from clouds and which is why when clouds are illuminated with white light, they reflect and scatter white light. See the illustration below. So, consider the case illustrated in the following photograph. This photograph shows some clouds, just at sunset. The clouds reflect and scatter the light that strikes them, which is normally white light, so they show up as white, but in this case the light at the distant sunset is red and the therefore the clouds reflect and scatter red light. Well, if I had been outside a little latter in the evening after sunset, I might have also been lucky to see the last SpaceX rocket launch of the year from Vandenberg, CA. 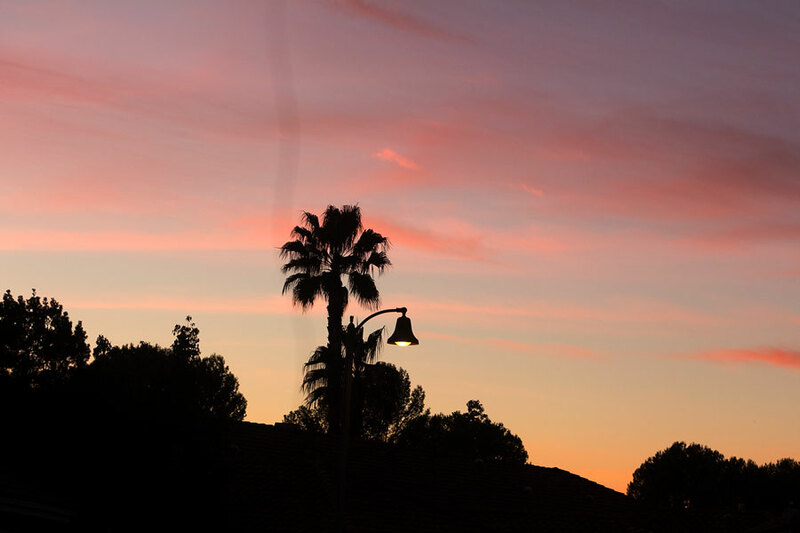 Well, Gravity Guy, Ken, was outside in Murrieta, CA, and captured this image. Wow, thanks for that Ken, that is really great! I have no idea why we are seeing such strange trails and orbs and such? It is pretty neat. Maybe we will hear latter in the next couple of days what we are seeing at each of the various locations during the rocket launch. Anyway thanks for that photo, Ken! Editors Note: The following website post by OCA Dave Kodama came out after this post was released, but it contains some other images and images of the SpaceX launch that are very impressive. Thanks for that Dave! 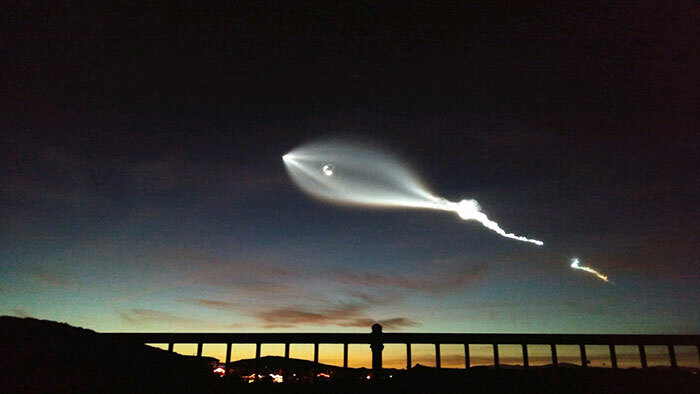 I hope all of you have clear skies or maybe just lucky enough to see strange object in your skies. Of course at this time of year, we all need to be on the lookout for something like a giant sleigh pulled by reindeer. At any rate we hope you all have a Merry Christmas or however else you choose to celebrate this holiday season!